Our handcrafted Fire Pit Spark Screens are designed for the piece of mind while having fires. They are made using high quality 1/4" thick carbon steel. By using 1/4" thick steel your spark screen will last. They come painted with a high temperature black paint. Carbon steel will oxidize just like your fire pit and form an outside surface rust. You can choose to leave it alone or repaint from time to time. Each screen has tabs welded on the inside so they sit properly on your fire pit. We make our screens to order based on the complexity and time it takes to make a quality screen. OUR PRICE INCLUDES SHIPPING DIRECT TO YOU PLEASE ALLOW 2-3 WEEKS FOR US TO MAKE AND SHIP YOUR SCREEN. SPARK SCREENS SHIP SEPARATE FORM FIRE PIT ORDERS. Feel free to call, 404-840-8474, with any questions you might have regarding our spark screens. Our handcrafted Fire Pit Spark Screens are designed for the piece of mind while having fires. Our Pivot screen will allow you to open either side of the screen to easily add wood while having a fire. They are made using high quality 1/4" thick American made carbon steel. By using 1/4" thick steel your spark screen won't succumb to the heat and will last. They come painted with a high temperature black paint. Carbon steel will oxidize just like your fire pit and you can choose to repaint it from time to time. Each screen has tabs welded on the inside so they sit properly on your fire pit. We make our screens to order based on the complexity and time it takes to make a quality screen. OUR PRICE INCLUDES SHIPPING DIRECT TO YOU PLEASE ALLOW 2-3 WEEKS FOR US TO MAKE AND SHIP YOUR SCREEN. SPARK SCREENS SHIP SEPARATE FORM FIRE PIT ORDERS. Feel free to call, 404-840-8474, with any questions you might have regarding our spark screens. Our handcrafted Fire Pit Spark Screens are designed for the piece of mind while having fires. Our Pivot screen will allow you to open either side of the screen to easily add wood while having a fire. They are made using high quality 1/4" thick carbon steel. By using 1/4" thick steel your spark screen will last. They come painted with a high temperature black paint. Carbon steel will oxidize just like your fire pit and form an outside surface rust. You can choose to leave it alone or repaint from time to time. Each screen has tabs welded on the inside so they sit properly on your fire pit. We make our screens to order based on the complexity and time it takes to make a quality screen. OUR PRICE INCLUDES SHIPPING DIRECT TO YOU PLEASE ALLOW 2-3 WEEKS FOR US TO MAKE AND SHIP YOUR SCREEN. SPARK SCREENS SHIP SEPARATE FORM FIRE PIT ORDERS. Feel free to call, 404-840-8474, with any questions you might have regarding our spark screens. Our handcrafted Fire Pit Spark Screens are designed for the piece of mind while having fires. Our Pivot screen will allow you to open either side of the screen to easily add wood while having a fire. They are made using high quality 1/4" thick carbon steel. By using 1/4" thick steel your spark screen will last. They come painted with a high temperature black paint. Carbon steel will oxidize just like your fire pit and form an outside surface rust. You can choose to leave it alone or repaint from time to time. Each screen has tabs welded on the inside so they sit properly on your fire pit. We make our screens to order based on the complexity and time it takes to make a quality screen. OUR PRICE INCLUDES SHIPPING DIRECT TO YOU PLEASE ALLOW 2-3 WEEKS FOR US TO MAKE AND SHIP YOUR SCREEN. 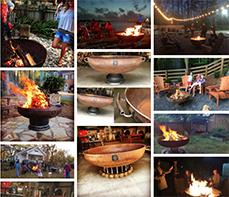 SPARK SCREENS SHIP SEPARATE FORM FIRE PIT ORDERS.Feel free to call, 404-840-8474, with any questions you might have regarding our spark screens.